Some recent campus actions border on the surreal. In April, at Brandeis University, the Asian American student association sought to raise awareness of microaggressions against Asians through an installation on the steps of an academic hall. The installation gave examples of microaggressions such as "Aren't you supposed to be good at math?" and "I'm colorblind! I don't see race." But a backlash arose among other Asian American students, who felt that the display itself was a microaggression. The association removed the installation, and its president wrote an e-mail to the entire student body apologizing to anyone who was "triggered or hurt by the content of the microaggressions." 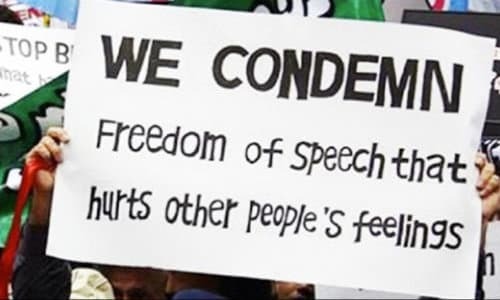 We are rapidly getting to the point in this country where a large portion of the population will be deathly afraid of saying or doing anything the least bit controversial for fear that someone might be "offended". For instance, last year administrators at Bergen Community College, in New Jersey, suspended Francis Schmidt, a professor, after he posted a picture of his daughter on his Google+ account. The photo showed her in a yoga pose, wearing a T-shirt that read I will take what is mine with fire & blood, a quote from the HBO show Game of Thrones. Schmidt had filed a grievance against the school about two months earlier after being passed over for a sabbatical. The quote was interpreted as a threat by a campus administrator, who received a notification after Schmidt posted the picture; it had been sent, automatically, to a whole group of contacts. According to Schmidt, a Bergen security official present at a subsequent meeting between administrators and Schmidt thought the word fire could refer to AK-47s. Some Americans celebrate Christmas, some celebrate Hanukkah, some celebrate other holidays and some don't celebrate any holidays at all. Honestly, sometimes I don't even recognize this country anymore. From the cradle all the way through college, we are raising a generation of overprotected "snowflakes" that have been trained to throw temper tantrums whenever their protective bubbles are somehow pierced by the real world. But vindictive protectiveness teaches students to think in a very different way. It prepares them poorly for professional life, which often demands intellectual engagement with people and ideas one might find uncongenial or wrong. The harm may be more immediate, too. Sadly, an increasing number of Americans don't want that. Instead, what they want is for those that hold "intolerable" views to be punished by society. We see this in the headlines on a daily basis in 2018, and it is getting progressively worse with each passing year. Political correctness has become institutionalized, and if you think that the "thought police" are bad now, the truth is that the next generation is going to be even worse.